For various reasons Braid does not fit to current gaming industry. It has no zombies, no shooting not even a multiplayer. It is an old fashioned 2D platformer with main focus set on logical elements — clearly, it does not sound like a recipe for a success in present times. So, what should be expected from a game prepared according to such formula? Without exaggeration, one of the most unique experience of the decade! 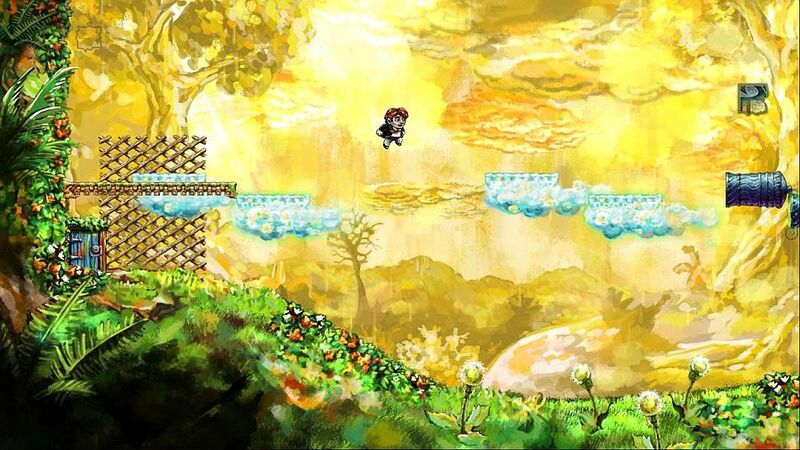 Braid was in production for three years. That is a lot, especially for a game that can be finished during a single afternoon. However, as soon as you start it you will realize that none of this time was wasted. Every element of Braid is incredibly polished: The graphic design is delightful, the music is delicate and soothing, the story is intelligent and most of all: the puzzles are diabolically clever. It gets even more impressive once you realize that Braid is basically a one-man project — besides graphics and music all work has been done by Jonathan Blow — a man gaming industry needed for a long time. Blow filled his game with lots of references to the most famous representative of the genre — Super Mario Brothers. Tim, main protagonist, jumps on the heads of enemies to get rid of them, avoids deadly plants coming out of pipes and hurries to rescue the princess. What is more, one level is a reminiscence of a classic Donkey Kong stage with ever higher platforms connected via ladders. However, Braid is far from being a simple copy — Blow took all these staple elements, mixed them with technical novelties and fresh design and created a game that is both old school and modern. As in any platformer, in Braid you have to move from the left to the right side of the screen, jump a lot and try hard to omit any obstacles. Okay, you don’t have to try that hard to omit obstacles. That is because Tim posses a very special sort of abilities — he can manipulate time flow. If you fall into the pit or get hit by a goomba you can always go back in time and try once again. It does sound like pretty much of a facilitation but main purpose of this game is not avoiding death but solving puzzles and to do that you will have to master Tim’s abilities. In Braid there are 60 puzzle pieces, 12 per world, and to gain access to the last chapter you will have to gather them all and subsequently assemble five pictures. The game allows for a little nonlinearity here since you don’t have to collect puzzle pieces in any fixed order — fortunately, because getting each one of them requires solving a conundrum and doing that on the very first attempt can be problematic. The quality of puzzles is rapturous. Starting slowly with almost effortless tasks the game gradually throws at you more and more demanding both intellectually and dexterously challenges. Yes, this game is difficult. Frequently frustrating, but that’s the beauty in it and precisely the reason why Braid is so compelling. Every piece collected is a success, every problem solved a triumph and it gets addictive — you cannot simply walk away from an unbeaten puzzle. Gameplay gives horrid amounts of satisfaction and the more time you spend on a single challenge the more rewarding it feels once finally your brain clicks and solution lies bare in front of your eyes. I fear to imagine what a fiendish mind must it take to craft such conundrums. Concept of time plays a big role in Braid — appearing not only in gameplay but also the story. The plot is told by fragments of books, placed at the beginning of every chapter, giving us insight into Tim’s thoughts or describing events from his life. Also, these text introductions are neatly connected to new mechanics appearing in subsequent worlds — that gives Braid something unique: a coherency between two aspects of the game. This correlation between mechanics and story is perhaps best visible at the dramatic ending where time manipulation is used directly as an instrument to depict the plot. At first sight the story feels quite fairy-tale. Tim strives to rescue his beloved princess, whom he lost for unknown reason. It may look trivial but do not be deceived by appearances — in fact it is a depressing tale about unfulfilled love and human inability to undo past mistakes. Well, you wouldn’t expect that kind of seriousness from a game that looks like a pastel painting but it fits in well and acts as a pause between sets of effortful puzzles. However, there are fragments that seem overly enigmatic or incomprehensible at all. With all its virtues Braid ends far too early — it takes from six to eight hours to finish. However, it is six to eight hours of unique, almost perfect gameplay endowed with stirring and mature story. To me Braid is a real gem — shining brightly among hundreds of other repetitive games — clearly demonstrating that, no matter of budget, with creativity and ambition one can still make excellent games.